After the interview it is natural to reflect on your performance and analyse your responses from an interviewer’s perspective. But what happens after the interview? Does it really matter what you do next? The answer is most definitely yes, your interview isn’t over until your first day so your actions between now and then could still make the difference between successfully starting a new job or going back to the drawing board. This blog covers it all, from waiting for a response to receiving an offer and ultimately your first day at work. After your interview, you should be aware of the next steps in the process outlined by your recruitment agency contact and/or prospective employer. The key piece of advice is stick to the agreed process and remain flexible. If your interviewer has already been in contact with the recruitment agency, your contact may be able to share immediate feedback with you and inform you of the next steps. In any situation, it is best to call your contact as soon as possible, so they are able to represent you and reach out to the client early on, further communicating your punctuality and enthusiasm. Remember the agency wants you to get the job just as much as you do, they are there to help and support you. If you are still unsure of the process, ask again for an estimated timeline, ‘when can you expect to hear’ and ‘what you should do if you haven’t heard anything’. Once you have a clear understanding, make every effort to stick to the process. There is a fine line between being enthusiastic and annoying so proceed with caution and respect the process. Ignoring the agreed process will only show your employer that you are unable to follow instructions, before you have even started. In aviation, most roles will require at least a second interview or assessment, which will most likely require travel to another country. 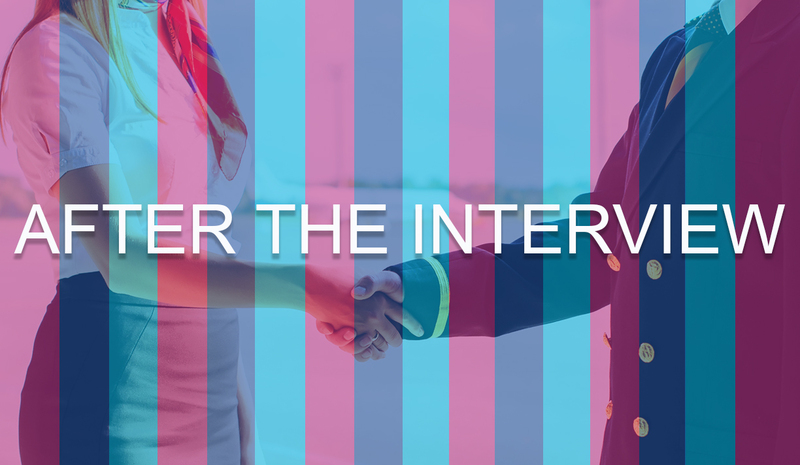 If you have committed to the first interview, it is crucial that you commit to the rest of the process, ensuring you are available for assessment / training days, including travel routes to the location. Make sure you stay contactable, keep your phone with you where possible and monitor your emails. Also, bear in mind that flight delays do happen, so always have a back-up plan, and give yourself ample time! Showing a lack of flexibility and availability will not bode well with either the recruitment agency or the client. Not only could it effect your chances in getting the current role, but any roles you may apply for in the future. Ensure you are a reliable, flexible, and available candidate where possible. Ask for feedback, feedback (where available) will only help improve your performance for future opportunities and make you a stronger candidate in the long run. If you’re successful – Prep, prep, and prep! Is your accommodation organised, ensure you have booked or rented sufficient accommodation in advance. If you are commuting to work and haven’t made the journey before, try the commute at least one day before you start to understand the route and typical peaks of traffic for your estimated time of travel. If you realise the route you need to take is longer, or in worst case scenario, not available, you can find alternative arrangements for your first day. It is now your first day and your new employer has chosen you from a long list of other candidates. Be proud of your achievement and maintain your standards throughout your time of employment as you may be considered for future promotions, or even receive a glowing reference when you do decide to move on. Expect a call from your agent on your first day as they will want to make sure it is going well. If you’re an AeroProfessional candidate and need more support preparing for your first day, or have any questions about your own recruitment process, contact us today.